-Germany’s first ever win against Italy in a major tournament after nine attempts. -Germany have now won six shootouts in a row. -Simone Zaza was brought in especially for the shootout just before the end of extra time and did a Wile E. Coyote impression instead of taking a proper penalty. -Graziano Pelle tried to get in Manuel Neuer’s head by calling his shot, then missed in a way that was somehow ever worse than Zaza’s effort. -Germany have now reached seven consecutive major tournament semifinals. -But the match wouldn’t have even gone to penalties if Jerome Boateng hadn’t done his impression of an inflatable air dancer to give Italy a penalty to equalize in the 78th minute. 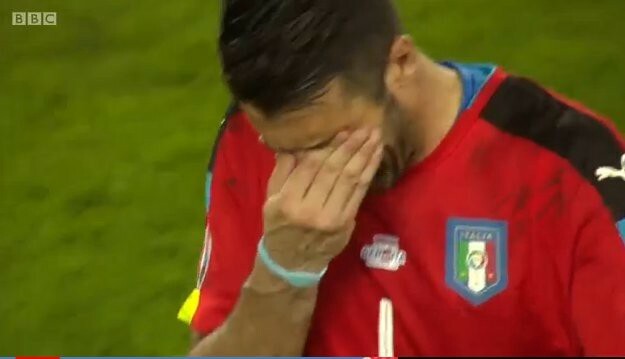 -Italy defender Leonardo Bonucci then converted that penalty despite never taking one outside of a shootout in his life. Of course, he then went on to miss in the shootout. The fact that two of the best teams in this tournament were forced to meet in just the quarterfinals seemed insane enough, but for them to then put on this comedy act of a match was even better than if they had carried out a masterful exhibition of skill.